Trixon drums, made in Germany and later in Ireland, were brief, colourful features of the '60s instrument explosion. Alongside Sonor, Trixon rose from a stricken post-war Germany. But while today Sonor has prospered, Trixon's reign was cut short in 1971, and the brand is now recalled fondly for its crazily shaped shells. Trixon was not unique in this—there was a propensity in Europe for the novel—but Trixon was the daddy. Later badged as Vox in the United States, Trixon was a pioneer in other areas too, with bold finishes and some nifty hardware designs. The drum set is an invention of the 20th century and it was evolving rapidly when the not insignificant squabble of World War II held things back and devastated European production. The north German city of Hamburg was pummelled by Allied bombing, but from the ashes Karl-Heinz Weimer, a remarkable 30-year-old musician, inventor, and entrepreneur, launched Trixon drums. His path was, to say the least, "tricky"—a word from which the Trixon name was apparently derived. Germany remained under the occupation of British forces in the north and American in the south, and the troops hankered after jazz and swing music, hitherto forbidden under the German Reich. Unfortunately, Germany had very few suitable instruments, which afforded Weimer the chance to follow his dream. Clearing a patch of stricken land, he began manufacturing in a ruined air-raid shelter. He secured a trade licence on September 18, 1947, and the company was officially born. By 1948, Weimer had moved to another ruined shell of a building, building it up room by room to make the first Trixon factory and using it through to 1956. Despite all manner of tricky problems to do with supplies and materials, Weimer succeeded almost immediately. 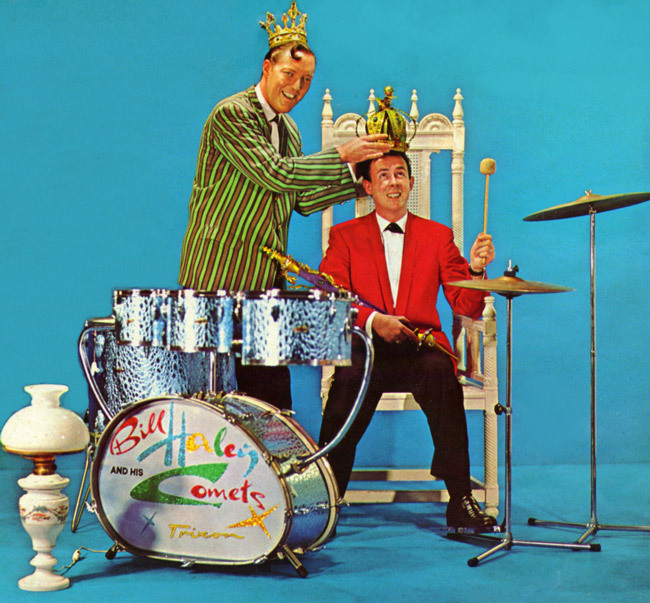 He'd found a niche that needed filling, and he built not only drum sets but also Latin percussion, vibraphones, sticks and mallets, music desks, and more. From the start, Trixon products were distinctive and of professional quality, and they were first exhibited at a trade show in 1948. Over the next few years, Weimer's success attracted business partners and capital, and in 1953 he registered the Trixon trademark at the German patent office. Additionally, Weimer opened his Music City store in Steindamm, Hamburg, in 1955 and soon took on distribution deals for Paiste, Zildjian, and others. His story is full of remarkable incidents, not least when Robert Zildjian (who later founded Sabian cymbals) visited Trixon in Hamburg in 1954. Zildjian, who had served with the U.S. Forces in the war, recognised Weimer as a prisoner-of-war musician whose services the Americans had called upon, and a deep friendship was sealed. 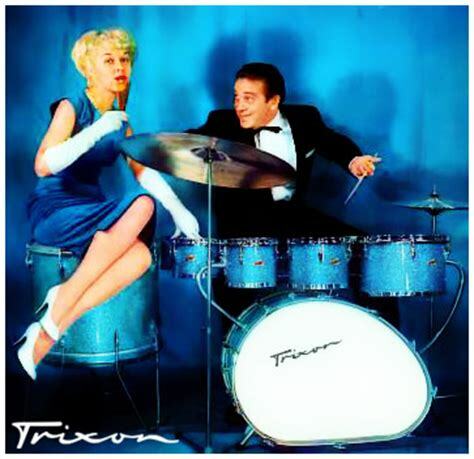 Trixon not only became popular in Europe but attracted visiting American jazz stars, the most prominent being the great Lionel Hampton, who endorsed both Trixon vibraphones and drums. Weimer and Hampton, too, became lifelong friends. Weimer had a counterpart in the UK in Ivor Arbiter. Arbiter also faced post-war obstacles, in particular the British government's restrictions on American imports, intended to boost UK businesses and lessen the hellish dollar deficit. This meant Arbiter could not bulk-import the American instruments—particularly guitars and drums—that British musicians craved. Britain made very few guitars, and they were exactly what was needed as rock took over from jazz. Instead, dealers and distributors in the UK scoured Europe, which is how Arbiter came upon Trixon drums. In fact, while UK guitarists made do with all manner of foreign guitars, British drummers were well catered for by British-built Premier drums and smaller competitors such as Ajax, Beverley, and Carlton. But Premier ran a tight dealer structure, which Arbiter resented. 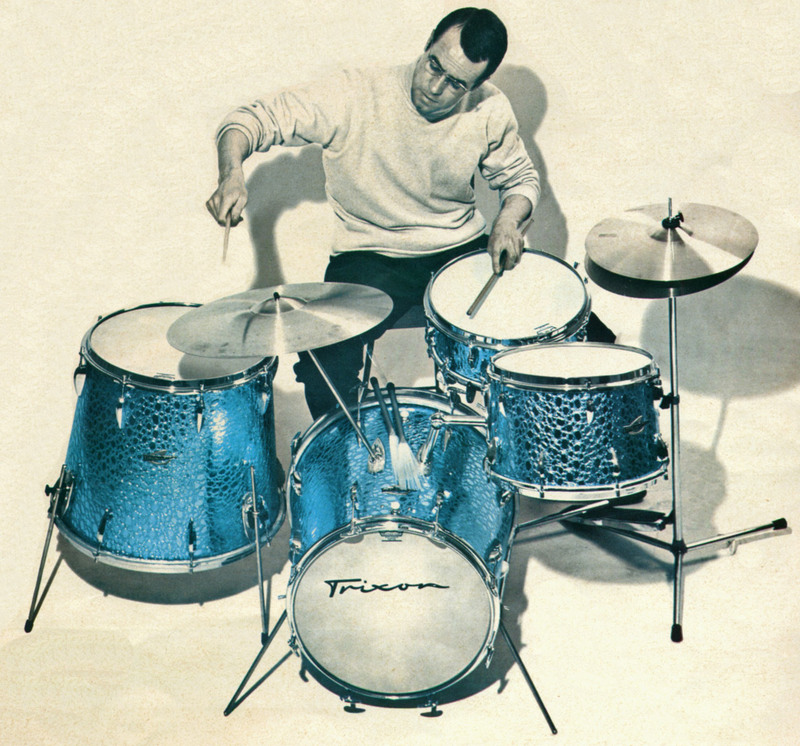 So in 1957, he struck an import deal with Weimer to bring over from Germany around 50 Trixon drum sets every month. Arbiter's close contacts through The Paramount music shop in London's West End, which he'd opened with his father Joe in 1957, meant he was able to persuade jazz heavyweights such as Phil Seamen and Allan Ganley to endorse Trixon. Soon the young rockers came on board, too, including Brian Bennett, Clem Cattini, Bob Henrit, and many more. "Weimer was ahead of his time, and he developed a lot of die-cast stuff in nice, ship-shape forms. We did quite well with Trixon, but drumming was getting heavier and Trixon started to make some silly mistakes." Serious players mostly stuck with Trixon's conventionally shaped Luxus outfits. Arbiter's sidekick Gerry Evans, who worked at The Paramount, told me: "Karl-Heinz Weimer was such an innovator. Trixon wasn't fantastic, but it was progressive. For example, all the stands had spring-loaded ("klick-klack") legs, an idea that was later copied by Ajax." Arbiter added: "Weimer was ahead of his time, and he developed a lot of die-cast stuff in nice, ship-shape forms. We did quite well with Trixon, but drumming was getting heavier and Trixon started to make some silly mistakes." By the early '60s, Arbiter says he eased away from Trixon because of quality problems. "While the hardware looked OK, it wasn't too strong. The nut boxes would come off, for example." With UK restrictions on American gear finally lifted as the '60s dawned, Arbiter made the bold decision to import the expensive Ludwig drums. He opened Drum City at 114 Shaftesbury Avenue in the West End in 1962, and pretty soon Ringo Starr came knocking. Arbiter told me that he tried to push a Trixon set on to Ringo, but Ringo was not having it. Throughout its history, Trixon produced a conventional four-piece drum set, the Luxus 0/200. In 1963, Arbiter listed the Luxus at 161 guineas, which was considerably less than a Ludwig Super Classic and much closer to an equivalent Premier set. Many Luxus sets survive today, and like contemporary Sonor sets, they were built from quality German beech. 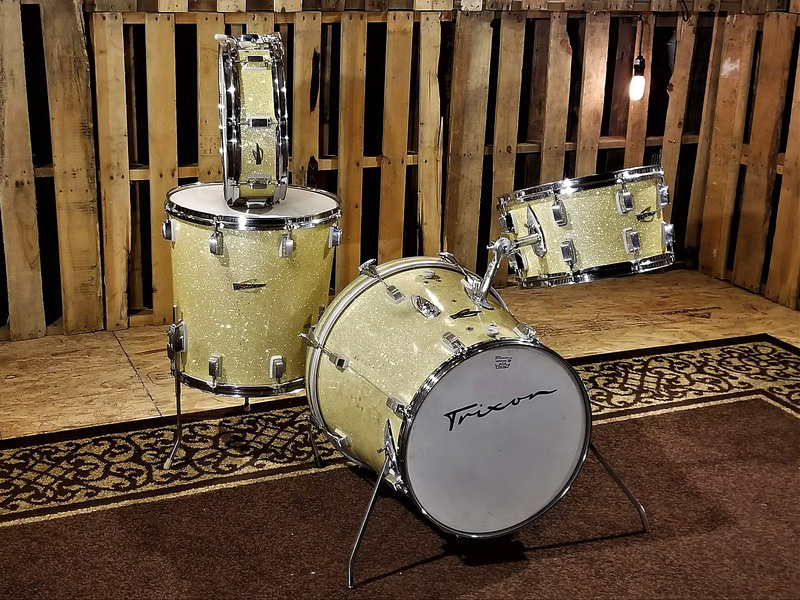 Also like Sonor—and many UK drums of the period, too—they had teardrop-shape die-cast lugs until around 1963, when they were replaced by oblong lugs with isolating gaskets that enhanced resonance and were ahead of their time. However, Trixon will forever be associated with crazily shaped shells. The Speedfire 0/700 set with its elliptical egg-shape bass drum appeared as early as 1956, and it was showcased by Lionel Hampton. The idea was to conjoin a small and a large bass drum in a single shell with an internal partition. The flat bottom hoop could accommodate two side-by-side bass pedals. There was also a row of single-headed toms arranged in "backward" order, which made it easier to mount them level. And finally, there was the monstrous 20-inch-diameter Lionel Hampton Attraction floor tom, with its three V-shaped strengthened legs that enabled the athletic Hampton to jump up on it and play it in his frenetic showman style. While the Speedfire was ungainly, the Telstar, introduced in 1962 and named for the communications satellite, was fabulously modern looking—though in fact, with its antennae-like splayed floor tom legs, it looked more like Russia's earlier Sputnik. It was also more practical than the Speedfire. The Telstar was the set with the conical shells, Trixon's most abiding image, requiring a production process that was enormously wasteful of timber. Yet the concept was actually sonic rather than visual, intended to compress and intensify the sound from the large batter head to the smaller resonant head, like a sort of reverse megahorn. Trixon's turnover reached around 3,000,000 Deutschmarks in 1965, about $750,000 at the time. In December '65, Weimer moved his Music City emporium to Hamburg's Reeperbahn, scene of The Beatles' earlier exploits and where British groups still plied their trade. With about 7,500 square feet of retail space, Music City was one of Germany's biggest music stores. That same year, Weimer visited the Far East and returned with a contract to produce a thousand marching drums for Chairman Mao's troops, no less. With sales in the USA also booming, he needed a large increase in manufacturing capacity, and in 1966 Weimer built a new plant in Reinbek, about 12 miles east of Hamburg. It covered 43,000 square feet and employed 140 workers. Trixon's reputation was now such that none other than Buddy Rich visited the Reinbek factory on March 29, 1967. Rich was hard on the formation of his Big Band and his consequent wowing of Europe, and he came personally to pick up his specially designed Luxus outfit. He'd somehow been persuaded by Weimer to endorse the drums—a rumoured sweetener of $100,000 may have swayed his mind—but the relationship lasted after just a few months, with Buddy reverting to Slingerland or Fibes or both once he was back home. Never mind—what's certain is that James Brown's drummers played Vox-branded Trixon drums on stage during 1968. All this feverish activity led to Trixon's fatal mistake and its shockingly speedy demise. This was the infamous move to Ireland. The Irish government was offering considerable financial, economic, and tax inducements to bring work to the beleaguered Republic. Trixon Ltd moved most production from Reinbek to a 600-acre industrial estate at Shannon Airport, the world's first free-trade zone, working alongside the Dutch Rippen piano company. Rippen pioneered a lightweight piano using wood, metal, and plastics, thus sharing many similar procedures with Trixon. It made sense to share facilities and inventory—for the moment. Trixon was already distributed in the U.S. by St Louis Music Supply Co, but Rippen's deal there was with the Thomas Organ Company, and the Shannon-built Trixon was able to avail itself of this favourable connection for distribution, sales, publicity, and so on. Thomas also distributed the famous British Vox amplifiers, and thus Trixon was re-branded Vox in the USA. This necessitated a change of names for the sets, presumably to avoid a conflict with St Louis, which is why for Thomas the Trixon Luxus became the Vox Thunderbolt, the Trixon Telstar became the Vox Fanjet, and the Trixon Speedfire, confusingly, became the Vox Telstar. Unfortunately, Rippen's cheap-piano experiment did not work out and its Shannon operation went belly-up around 1971, dragging the inextricably bound Trixon down with it. With 70 percent of production machinery held in Shannon, Weimer could not continue in Hamburg, although he did offer parts and servicing for several years through his successful Music City store. About the Author: Geoff Nicholls is a musician, author, journalist, and lecturer based in London. He played drums on BBC2 TV's award-winning Rockschool in 1984 and 1987 and wrote Byte The Music for BBC Radio 3, which won first prize at the New York Radio Festival in 1994. His books include The Drum Book: A History Of The Rock Drum Kit (2007) and The Drum Handbook (2003), and he is a regular contributor to Rhythm magazine. A recommended read with forensic detail about Trixon is the comprehensively researched 2007 book Trix On Trixon: The Story Of The German Drum Company by Ingo Winterberg with Martin Grimsel (trixondrums.de), which was of invaluable help for this piece.